Within Open! Academy Open! occassionally publishes research, essays and reports that came into being within educational contexts. This text by artist k.g. Guttman is an individual writing project she produced as a PhD candidate at PhDArts Leiden University / KABK Den Haag that offers a doctorate in art and design. This essay is an exploration of thoughts following an artistic event that happened a year ago, specifically in terms of how it deploys its own forms, intensities and energies that are essentially ungraspable by language. The type of reflection writing enables is therefore specific to its medium. As theorist Rebecca Schneider reminds us in discussing a politics of documentary practices, ‘…media has its specific ways of remembering and will leave their trace on the memory it creates.’3 Writing inevitably translates the piece and my relation to it, and writing allows for reflective confrontation with the ambiguities of my position contained in the artistic process. Looking back expands certain insights and diminishes others. I see now that I did not then understand the depths of the colonial legacy I was probing. Fear of losing the details contains the wariness of how and when to speak about the geopolitical narrative of Canada’s brutal colonial history. I must attend carefully to the limits of my subjective knowledge as a Canadian of European ancestry, aiming to deepen my understanding of colonial injustice through the encounter of the research. ‘It must be admitted from the outset that Native Americans are peoples about whom we can have nothing to say that is not fatally contaminated by Eurocentric patterns of thinking. …’4 In order to take into account my personal role and experience within the larger political forces at work in territorial, colonial and economic issues in Canada, in Fear of losing the details I situated the inside of my childhood home as the object of scrutiny, witness and potential. The project grew out of the desire to peel open the whole house, set it on display as a historical item, as a sculpture, as an event, and to invite a ‘public’ into the house to express a desire for connectivity and to engage with how site-specific art practice might create connections between imagination and history. Fear of losing the details involved a personal unlearning of Canadian national myths, beginning with finding a copy of the original Treaty No. 13 at the local public library and experiencing a tremor at the realization of its genocidal technocratic power.5 This quiet find in the library tore up the ground of my identification with a Canada that had a seemingly peaceful and democratic foundation. It propelled the inquiry into how the movement of thought, of this personal discovery, might be transmitted in the site and in writing. 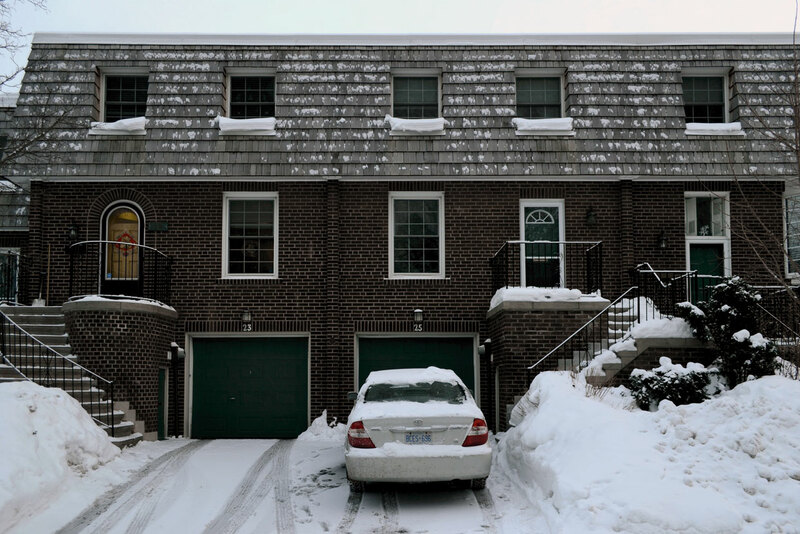 I always experienced a ‘suburban malaise’ in my North York home. It was the place where nothing happened, nobody came, and, as I did not drive until my thirty-third year, it was the place of waiting for the bus. The endless straight roads, the car as interface for everything, the Pizza Huts, the hot tar of the street in the summer, amounted to a relationship to a place of unease, skepticism and sadness. I was not surprised, somehow, to learn that its motto, approved in 1923 by municipal council, was ‘Progress with Economy.’6 After leaving home years ago to exit the suburban condition, I returned to examine how I belonged to it, and how it belonged to me, and if anything could shift. My parents moved to Toronto in the 1970s for academic appointments at the University of Toronto. It is an inter-faith marriage, my father a first generation Canadian of Eastern-European Jewish immigrants, and my mother of Irish Catholic American working class stock. They sought to emancipate their children from a religious upbringing. Toronto offered them calm space and freedom of thought. Education and public institutions were valorized in my family: political, economic and social justice were the pillars of my upbringing. Despite these commitments to building a critical awareness of social inequalities, the colonial narrative was starkly absent. It was this uneasy, awful omission in my upbringing that directed me toward probing my childhood house as a site to experiment with an entrenched way of seeing, between appearance and history. In the second stage, I developed modes of looking based on the movements of my body and the camera. I moved through the space at various tempos, levels and alignments of my head and spine. I recorded my point of view in relation to other proximities and distances. Through these actions my references of far, close, up and down became dislodged from their habitual references. 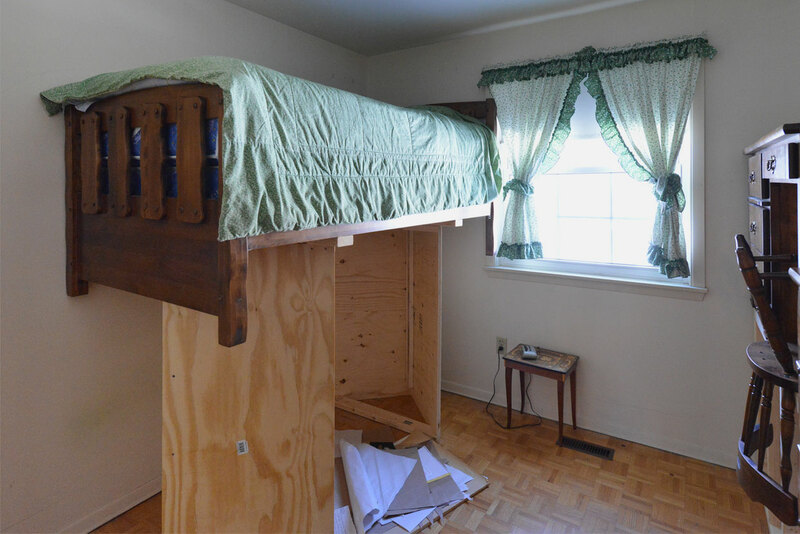 The third stage involved the manipulation of the house’s materials (furniture, household items, etc.) and documentation of these actions: piling them up, regrouping, reclassifying and realigning. I recorded these groupings through video, film and drawing. I moved, removed and added materials to existing ones, undoing and reconfiguring the functions and relations of things between themselves and with myself. I configured three objects in the space and chose a position from which to draw the composite forms on paper. I changed my position at least three times to produce a series of registers containing unusual assemblages of familiar items. Regrouping, reclassifying and realigning the items were actions based on quick and temporary composites formed by clearing paths across rooms. The regroupings were governed by the sequenced movement of my body that continually shifted on each day of practice. In other words, the regroupings were not organized by predetermined conceptual classifications of objects but were arrived at through movement practices, in a choreographic process of forging new pathways through the house. The objects that composed the final installation were the ones that remained in the rooms at the end of this two-month period of looking and movement exploration. It comprised a collection of stranded leftovers, infusing the house with a museum-like quality of holding artifacts or traces from a separate time distinguished from its present use. The process of observation, extraction and redistribution inverted an institutionalized installation process of inserting materials into an empty white cube. More specifically, the extraction of furniture and belongings revealed the destabilizing effect of undoing the function of a designated room. (How is a dining room a dining room with the table removed, for instance?) A rupture in the coherence of location was created, caused directly through clearing spaces in order to breathe, observe and move in indirect pathways inside the house. I announced the event on Facebook and formally invited the contemporary art community by e-mail. This designation extracted the house from its everyday routines, relocating the site to a new field of relations, aligning it with cultural production and alternative modes of spectatorship: the private visitor would be momentarily transformed into an ‘audience member’ and the private home would briefly become an art object. This performative designation elicited a transformation of the gaze from the mode of the personal to the distanced mode of professional / public space, as an audience might view an exhibition. A few raw unfinished plywood plinths were constructed and set in the rooms to mount and display household objects and furniture. These devices stood in contrast to and were interspersed with the smooth, polished wood of the remaining furniture, interrupting the functionality and direct contact of the objects in the embedded context of the house. The plinths pulled the mode of spectatorship closer to the conventions of an exhibition. Upon arrival, guests were invited into the kitchen for food and tea. No initial overview of the house was offered, they were simply welcomed into a situation of a house whose dimensions were not immediately revealed. I asked them to stay in the kitchen as latecomers arrived, which resulted in a compact and restrictive spacing that I had not planned. As I will explore further on, this improvised constraint became an affective choreographic force in the project: the imposed conditions transmuted the space into intensities and sensations of a situation. As soon as the public was seated in the living room, I took out a pencil and slowly started drawing a single line on the white walls, two feet up from the floor. Since many people had been leaning on the walls, my action around the room caused a group of bodies to scuttle out of my way. 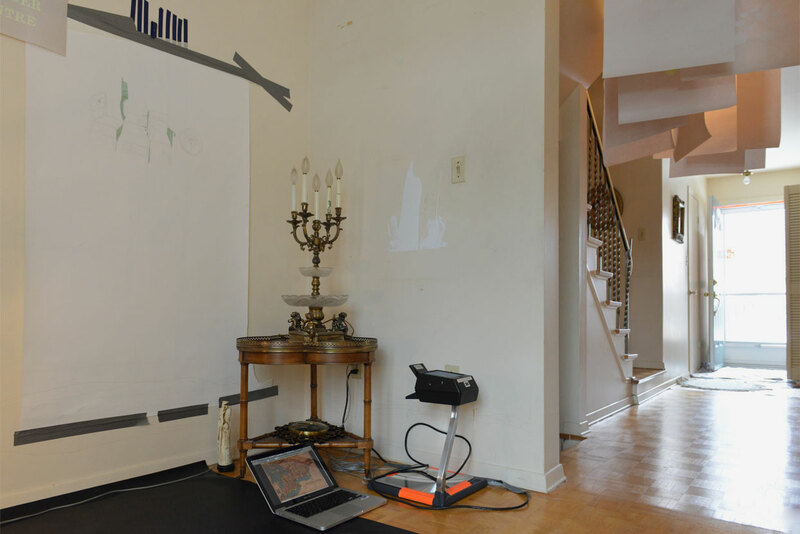 My drawing of the line traced a route through the entire house, underscoring the architecture, a sound and visual mapping, and offering a prepared tempo for the audience to follow me through the space. Carved into the living room ceiling was a hole of approximately 40 x 30 cm. The hole held an undetermined status; it was a deliberate gesture on my part to not explain its appearance to the audience. During my performance I reached my head and arms into the hole, and after some rummaging, I slowly plucked out a redheaded toy called a Cabbage Patch Kid from my childhood and briefly animated her with a short dance. The hole in the ceiling was my first awareness of many ambiguities seen through a newcomer’s eyes. Visitors started asking me which of the objects had been staged intentionally or where exactly the authentic lived in the context of the house. For example, they asked me who had chosen the artworks on the walls, who had written the sticky note in the kitchen with the long-distance calling rates, why were Christmas decorations hanging in the kitchen (the performance took place in March) and had the words and pen markings on the walls been made by me as a child or in the present? These items started to circulate with an uncertain status, activated by the audience’s observations. Once the audience had descended the stairs and reassembled in the living room, I stripped and jumped into the golden lampshade set on the floor with Treaty No. 13 in my hand. I invited a member of the public to stand in the lampshade with me, in order to read along together. I intended to assemble in proximity to the historic text, the body of an audience member and my bare body, rereleasing the treaty’s enunciations directly into the room, into the land it has enduringly shaped. I projected in large format a sequence of historical slides that showed the economic development of the suburb, ending with a slide of a pre-confederation map of Upper and Lower Canada at approximately the time of the treaty signing governing the site we were in. Sipping orange Gatorade, I then licked the wall along the projected traces of the map demarcations and flourishes. The gesture emphasized the temporal and physical act of drawing and reenacted the process of mapping as a series of time-based markings. The gesture of the tongue is significant for the idea of staking out a territory, as an animal would, by covering it with smells and liquids, mark making as claiming space. In order to foreground how the site of my house had become historically accessed, organized, perceived and recognized, I researched the Treaty No. 13 map, the surrender of land in 1787 by the indigenous Mississaugas of New Credit to the British Crown.7 I studied the treaty’s territorializing power and method of designation, division and legislation, conceiving of experimental spatial practices inside the house in reference to and in contrast to these methods. Treaty No. 13 consists of a two-dimensional document in two parts. One part is a legal contract written in English securing the ownership of the land, and the second a map depicting the geometrical parcel of land claimed by the Crown.8 The land was purchased at a scandalously low price of 10 shillings in 1787.9 In 2010, the settlement for monetary retribution was passed by the federal government. The treaty and the token settlement, in the guise of colonial civil and legal procedure, effectively displaced and disenfranchised the indigenous Mississaugas of New Credit onto a reserve, dispossessing a people of their ancestral lands and means of social and economic sovereignty.10 The treaty facilitated the claim and reorganization of a new colonial spacing of the land. The treaty map does not reveal the itineraries from which it was explored,11 but presents its contents as a pristine overview, a geometrical fragment with straight borders, super-imposed against the geographical irregularities of the land. The treaty governs through a procedure of regulating, homogenizing and centralizing the terrain: ‘…with the legal model, one is constantly re-territorializing around a point of view, on a domain, according to a set of constant relations.’12 The perspective from which the treaty is drawn is authoritative, fixed and distant, and does not account for the multiplicity of ambulatory experiences of space by embodied subjects walking through the land. In A Thousand Plateaus, Gilles Deleuze and Félix Guattari differentiate between a spatiality which they name as ‘sedentary’ conceived through a central organizing force, and a ‘nomadic’ spatiality in which space is inhabited by moving through it and by developing multiple and corresponding markers: ‘…there is a significant difference between the spaces; sedentary space is striated, by walls, enclosures, and roads between enclosures, while nomad space is smooth, marked only by traits that are effaced and displaced with the trajectory.’13 The Treaty No. 13 map’s efficacy and authority operate through the techniques of sedentary space, isolating a fragment of land in order to claim, master and divide the terrain. My childhood house is situated in this colonial legacy of sedentary space and bears its designating and regulating structural codes. My strategies were twofold, to interfere with the domestic setting by the introduction of the conceptual frames of performance, exhibition and artist studio, and to choreograph an unfamiliar itinerary through the house. These framings and movements interacted with the dominant historical coding of the space, aiming to suspend cultural and economic habitual modes of looking, calculating and identifying a space. In her book Chaos, Territory, Art, philosopher Elizabeth Grosz writes that the act of territorializing is the act of framing. Framing leads to aesthetic (spatial and temporal) interpretation and orientation. ‘With no frame or boundary there can be no territory, and without territory there may be objects or things but not qualities that can become expressive, that can intensify and transform living bodies.’16 This notion resonates with the metaphor of splitting the space of the house open to new associations and practices that unsettle its seemingly locked-in designation. 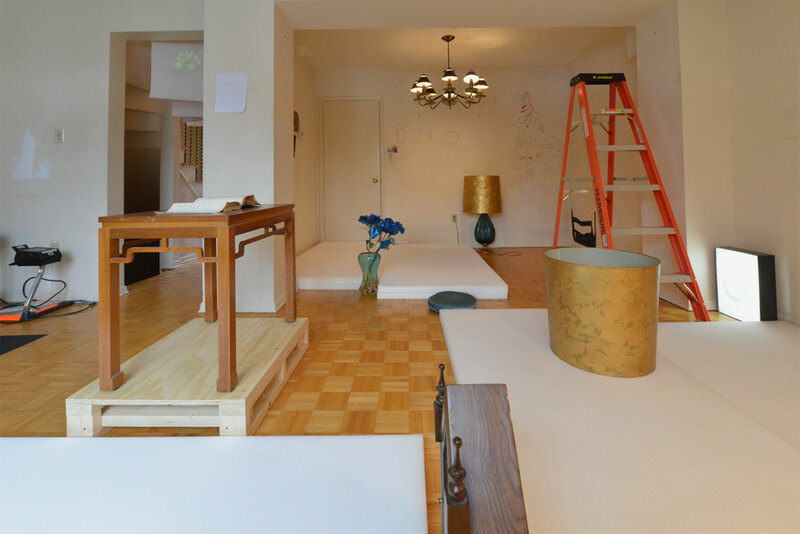 In other words, how does the introduction of artistic practices into the house temporarily de-frame the sedentary space and re-frame the space to allow for new perceptions and new configurations of being together? When guests arrived, I asked them to switch off their phones, as with conventional performances. This created a slight dissonance with the informal ambiance of a private house. It closed the space off from the outside, but sharpened the focus on the interior. Introducing this performance frame transformed the role of guest into audience member. In turn, the presence of the audience itself deeply constituted the transformation of the house, activating the site as a performative frame through their aesthetic gaze, and generating sensual and conceptual dimensions in the house experience. The house was revealed through movement, a series of constrictions and dispersions of the small crowd. As guests entered, I asked them to stay in the kitchen while we waited for latecomers. The request extended the time spent in the kitchen, unintentionally amplifying a sense of confinement due to the increase in volume of voices, warmth and proximity of bodies. This choreography produced a felt tension in the kitchen, quickly released with the opening of the dining room door and the group circulating on the main floor. It is an instance in which the choreography of spatial constraints and the material properties of the house entered a relational process to create a haptic, sonorous and visual experience. I then lead the group up the narrow stairs onto the top floor. They went single file and followed the narrow circuit looping around my bedroom and then descended back down. Some audience members were still going up as others were coming down, resulting in an elastic focus of where precisely the performance was ‘happening.’ The multi-directional movement of the audience, its snake-like formation, and the slowness of the crowd converging in a narrow passage became integral to the performance. The particular way of being together was inseparable from the space acting upon the group. Inhabiting the house as an artist studio for a couple of months unsettled the designation of each of its rooms. In the living and dining rooms, I had made a series of wall drawings and sketched out notes and forms on papers haphazardly taped to the walls, evidence of a messy creative process. These unfinished works and scraps hung under the elegant brass chandelier and in between my parents’ collection of exquisite landscape paintings that I had left. The sloppy amongst the polished elements of the room created parallel worlds, temporalized the space and showed the edges of overlapping territorializations. The co-presence of two modes of being in the space underscored the contentious nature of a territory: it is never a given space but must be actively constituted by markings. Introducing the conceptual frame of the exhibition into the house caused a disruptive force in the interpretation of certain moments of the site. Guests immediately asked to what extent I had changed the house: Were the paintings on the walls chosen by me? 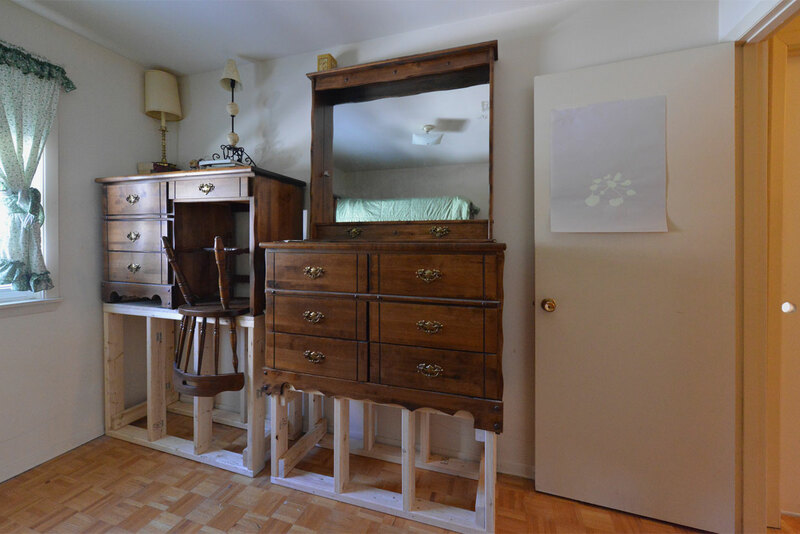 Had I brought in the antique furniture pieces? Was the retro vacuum really still the one that my mother used, or was it a found object from the 1970s I had brought in to evoke the period of my childhood? Was the aluminium ladder in the living room due to renovations? A cameraman arrived to document the project. Due to logistics I gave him very little instruction, and he kept on returning to seek confirmation that he was indeed capturing the intended interventions. He photographed the bathrooms, floors and windows. He photographed closed doors throughout the house. He did not discriminate between the notes and sketches taped to the walls, a hand-drawn schedule and a sticky note outlining long-distance calling rates. Through the ambiguity of the situation the house became a total object for him. The closed doors, for example, of rooms that I did not want to have exposed, appeared in the documentation and became instantly integrated into the installation, heightening affective and representational qualities of restriction. My nephew had drawn a vivid sprawling scribble in red marker on the entrance wall. I hastily decided to cover it up to lessen its intense visibility. What resulted was a messy cloud-like shape of white paint against the original fading cream wall. I did not think further about the painted blotch as I went on to prepare the space. However, this cloud-like form revealingly turned up in the documentation, photographed meticulously on its own, and additionally composed in the photographic frame in equal relation to the silkscreen prints I had hung from the ceiling. These photos were initially startling to me, as were the audience’s initial questions. They revealed my own embedded habits of looking and categorizing. I had not ‘seen’ the cloud-like, white painted form as ‘something’ to be documented, but only as the background of the ‘actual’ installation. The experience forced open the powerful differences in looking subjectively, and manifested the contrast between the seemingly evident appearance of things and their intended meaning or historical context. The ambiguity between the perception of an object belonging to the installation and / or belonging to the real, opens up the process for interrogating the real itself, or as Grosz formulates, interrogating the ‘indeterminacy of the real.’17 The ambiguity articulates the gulf between my intimate knowledge of the site and the audience’s perceptions, exposing the installation / performance site as densely layered. According to Grosz, the act of territorializing is the impulse to organize the unfathomable complexity of the real into a perceived alignment and interpretation: ‘The chaotic indeterminacy of the real, its impulses to ceaseless variation, gives rise to the creation of networks, planes, zones of cohesion, which do not map this chaos so much as draw strength, force, material from it for a provisional and open-ended cohesion, temporary modes of ordering, slowing, filtering.’18 The ‘real’ is territorialized into cohesion through modes of looking, organizing and moving. My re-territorialization of the house as exhibition temporarily inscribed its entire contents with the potential reading of an exhibition. And so the cloud-like painted form, the closed doors, the Christmas decorations, etc., became visible as artwork within the conditions of appearance of an exhibition. The single-line pencil drawing I performed that traced the entire house offered an itinerary that was an effective way to undo the perspective of an overview of the space, while using the immediately familiar convention of a house tour. The itinerary echoed the custom in commercial real estate of showing off the house for its value. Yet my approach also defamiliarized the notion of a commercial tour through my non-speaking presence and the mildly transgressive technique of drawing on the walls. On the one hand, drawing the line heeded and reenacted the surfaces of the house, its flat and perpendicular forms. The faint scratchy sound of the pencil underscored the presence of the enclosed space, vibrated the silent historical conditions that generated such forms of thought. On the other hand, drawing a fresh line experiments with making a new boundary between here and there, between another and myself, between in and out. In doing so, it reshapes the space and proposes a playful versatility in which a subject may orient herself to a location. It is a new map, redefining a territory. The action followed and echoed the walls already there while imposing a new line that was not previously there. If following is a manner of reinforcing the status quo, then my role as a mute tour guide embodied a double position: situated between the constraint of reinforcing the existing walls and the agency of making a new line. This double position undoes the clarity with which constraint and agency interact, and speaks to the entanglement between my home and myself, between artist and site-specific installation, between the infrastructural choreography of the territory and the counter-choreography of the individual. The pencil line re-inscribes the dimensions surrounding me, and yet the pencil line generates a margin of freedom in which to experiment. In a reciprocal cycle, I am choreographed by the historical preconditions of the site, and at the same time, I choreograph a creative capacity to respond to and resist the given conditions. Through practice-based research, Fear of losing the details created a rupture in the coherence of location, and in so doing facilitated experiments of spatial concepts in site-specific and choreographic practices. From the vantage point of one year having passed, the project marks an intimate and crucial process of reconnecting and reconstituting the site of my childhood home with the consciousness of the broader colonial ideology and structure it is enmeshed in. The research allowed for a process of making sense of myself in relation to the site of my house, revisiting, reintegrating and reimagining the notion of home as the complex and difficult movement between memory, art practice and history. The strategy of stripping out and undoing the designated practices of my home revealed the possibility for new perspectives to emerge that in turn temporarily shaped and redefined the space. Deploying Deleuze and Guattari’s concept of nomadic spacing, the research unleashed a disruptive force that unsettled the homogenous coding of sedentary space and re-territorialized the house with multiple orientations. 1. Michel De Certeau, The Practice of Everyday Life (Berkeley: University of California Press, 1984), 117. 2. Firat Oruc, ‘Kaleidoscopic Sovereignty: Literary Montage and Geopolitical Entanglement in the Postcolonial 1960s,’ Postcolonial Text 8, no. 1 (2013): www.postcolonial.org. 3. See Rebecca Schneider, ‘Performance Remains,’ in Perform, Repeat, Record: Live Art in History, ed. Adrian Heathfield and Amelia Jones (London: Routledge, 2011), 137–150. 4. Jimmie Durham and Jean Fisher, ‘The ground has been covered,’ Artforum, October 1988, 101. 5. ‘Treaty numbers 1 to 483,’ Indian treaties and surrenders from 1680 to 1902 (Toronto: Coles Pub. Co., 1971 [1891–1912]), 32. 6. 'A society based on a philosophy emphasizing technology worship, economic expansion and commodity accumulation is doomed to failure, as it leaves out an understanding of and respect for the sacredness of nature and the limits to human endeavor.' Robert Houle, ‘Land, Spirit, Power,’ in The Spiritual Legacy of the Ancient Ones (exhibition catalogue) (Ottawa: National Gallery of Canada, 1992), 48. 7. ‘Treaty numbers 1 to 483,’ 32. 8. Ibid. ‘There is significant scholarship on aspects of the problematic Misssissauga land surrenders in the Toronto area.’ Victoria Jane Freeman, '"Toronto Has No History!," Indigeneity, Settler Colonialism, and Historical Memory in Canada’s largest city,' PhD dissertation, University of Toronto, 2010, 23. 9. Mick Sweetman, ‘The Toronto Purchase: Greatest Swindle in Canadian History. Toronto Belong’s to the First Nations,’ Global Research, 21 January 2013, www.globalresearch.ca. 10. Mississaugas of the New Credit First Nation. ‘Our History,’ www.newcreditfirstnation.com. The traditional territory of the Mississaugas is located in south-western Ontario between Toronto and Lake Erie. It became increasingly difficult for the Mississaugas to survive with Euro-Canadian settlement, causing the Mississaugas to accept an offer from the Six Nations to establish a settlement on the tract of land held by the Six Nations. Present situation: approximately 1,788 band members with nearly half of the population living off-reserve due to lack of employment opportunities, inadequate land base and lack of available housing. 11. ‘If one takes the “map” in its current geographical form, we can see that in the course of the period marked by the birth of modern scientific discourse (i.e., from the fifteenth to the seventeenth century) the map has slowly disengaged itself from the itineraries that were the condition of its possibility.’ De Certeau, The Practice of Everyday Life, 121. 12. Gilles Deleuze and Félix Guattari, A Thousand Plateaus: Capitalism and Schizophrenia, trans. Brian Massumi (London: Bloomsbury, 2004), 420. Emphasis added. 13. Deleuze and Guattari, A Thousand Plateaus, 380. 14. Deleuze and Guattari, A Thousand Plateaus, 382. The Compact Oxford English Dictionary defines haecceity as the quality implied in the use of this, as this man; ‘thisness’; ‘hereness and nowness’; that quality or mode of being in virtue of which a thing is or becomes a definite individual; individuality. 15. I want to be clear that this is not an attempt to link the Deleuze and Guattari’s notion of nomadic spacing to indigenous or pre-colonial spatial practices. I am employing the concept as a contemporary strategy of artistic research in counter relation to the colonial and capitalistic forces that order and govern movement in the Canadian context. 16.￼ Elizabeth Grosz, Chaos, Territory, Art, Deleuze and the Framing of the Earth (New York: Columbia University Press, 2008), 8.
k.g. Guttman (Canada) is an artist and research candidate in the PhDArts program of Leiden University and the Royal Academy of Art in the Hague, the Netherlands. Her work, funded through the Social Sciences and Humanities Research Council of Canada (SSHRC), considers post-colonial discourse, choreographic practice, and site-specific interventions.